You can protect yourself from almost all taxi scams with just a bit of effort. We have all heard about taxi scams from friends, travel articles and guidebooks. For example, suppose you are in an unfamiliar city and your taxi driver takes you to your hotel by the longest (translation: most expensive) route possible, expecting you to pay an inflated fare. Or you get into a cab at a foreign airport, the driver pulls away, and you realize that the meter is not turned on. When you question the driver, he shrugs expressively and says, "No good," leaving you to wonder just how much this trip will really cost you. Even worse, your driver announces that he has no change, which means he will treat the difference between the fare and the face value of the smallest banknote you have as a colossal tip. Each of these scams is both frustrating and expensive. Most licensed taxi drivers are honest, hardworking people who are trying to earn a living. The few dishonest drivers out there have developed some clever ways to part you from your cash, but you will be ahead of their game if you learn to recognize common taxi scams. As you plan your trip, take the time to plan your taxicab trips as well as your hotel stays. Find out about typical fares from the airport to your hotel, or from your hotel to the attractions you wish to visit. You can use a website such as TaxiFareFinder.com or WorldTaximeter.com to do this. State and city taxi commissions, which issue taxicab licenses (sometimes called medallions), often post fare schedules on their websites. Travel guidebooks also provide information about taxi fares. Write down this information so that you can refer to it when discussing fares with your taxi driver. Some taxi fare calculator websites show maps of destination cities. These maps can help you learn various ways to get from place to place. Bear in mind, though, that these maps don't tell you everything about a city. Cab drivers often know several different ways to get from point A to point B, just in case an accident or traffic problem snarls up their favorite route. The shortest way isn't always the best way, particularly during rush hour. Taxi fares and rules vary widely from place to place. In New York City, for example, taxi drivers are not allowed to charge for luggage. In Las Vegas, you are not allowed to hail a taxicab on the street. Many jurisdictions in the US permit taxi drivers to charge higher fares during snow emergencies. A few places, such as Las Vegas, allow taxi drivers to charge passengers who pay with a credit card a $3 fee. One of the most confusing aspects of taxi fares is the "waiting" charge, which can be as much as $30 per hour in the US. We are all comfortable with the idea of paying a taxi driver to wait while we do a quick errand, but the waiting charge also applies when the taxicab is stopped in traffic or is moving very, very slowly. The meter can tell how fast the taxicab is moving and will switch to "waiting" fare mode once the vehicle slows down to approximately 10 miles per hour. A two-minute traffic delay could add as much as $1 to your total fare. Track your own route and record your experiences, just in case. Taxi drivers are less likely to take you on a meandering tour of the local area if they know you are following their turns on your map or smartphone. If you're not sure whether you are headed in the right direction, ask the driver, Next, write down your driver's name and taxi license number. If you forget your pencil and travel journal, pull out your camera and take pictures instead. Should you need to file a complaint after you leave the cab, you will have hard evidence to back up your claim. 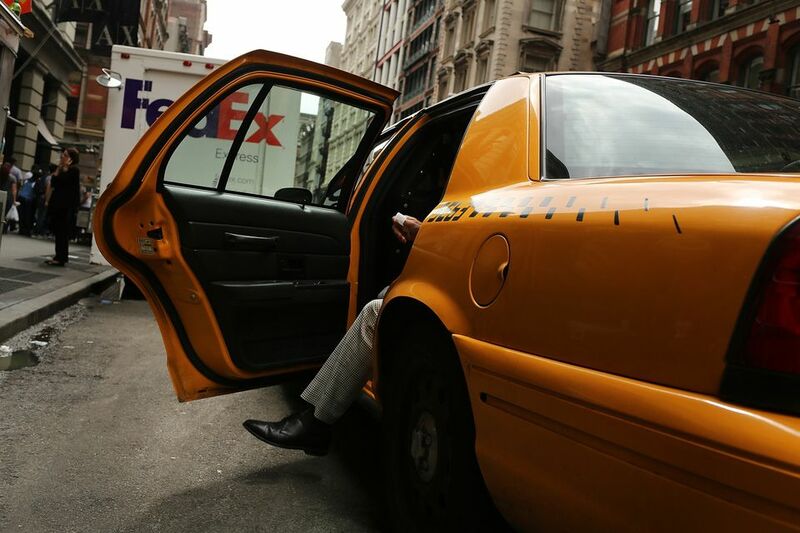 Most jurisdictions — states, regions, cities and even airports — have strict taxi licensing regulations. Find out what the taxi licenses or medallions look like in the places you plan to visit. Find out, too, whether some or all of the taxicabs in your destination city accept credit card payments. To protect yourself from scams, accidents or worse, never get into an unlicensed taxi. In addition to the taxicab scams mentioned above, there are a few universal scams you should know. One common trick is exchanging a large bill, offered by you in payment, for a smaller one, quickly switched by the taxi driver. Carefully watch your driver's actions to avoid becoming a victim of this sleight-of-hand scam. Even better, pay from your stack of small bills so that the driver will not owe you any change. If you are taking a taxi in an area that does not use meters, settle on a fare with your driver before you get into the cab. Here is where your pre-trip research will pay off. If you know that the fixed fare from your airport to downtown is $40, you can turn down a driver's suggestion of a $60 fare with confidence. Do not get into the vehicle until you have agreed on a fare you are comfortable paying. In the "broken meter" scam, the driver pretends the meter is broken and tells you what the fare will be. The fare usually turns out to be higher than the metered fare. Do not get into a taxi with a broken meter unless you negotiate the fare ahead of time and believe it to be reasonable. Certain parts of the world are notorious for their taxi scams. Take a few minutes to look up your destination in a travel guidebook or online travel forum and find out about local taxi scam tactics. Ask friends and colleagues about their experiences. Avoid unlicensed taxis at all costs. Save your receipt. You will probably need it if you decide to file a claim. Your receipt may be your only proof that you were in a specific driver's taxicab. Remember to check your receipt against your monthly statement if you pay your fare by credit card. Dispute charges you do not recognize. If you cannot come to an agreement with a taxi driver, walk away and find another cab. If the worst happens and your driver demands more money than you originally agreed to pay, leave the agreed-upon fare on the seat and leave the cab.